Remember Mark's bean sprout experiment? I was intrigued by the idea of feeding beans to Lucy too, but wanted to get a bit more information before I headed straight into the world of dog cookery. So I ordered Earl Mindell's Nutrition & Health for Dogs through interlibrary loan --- yesterday it arrived and I tried out Lucy's first home made meal. The result? 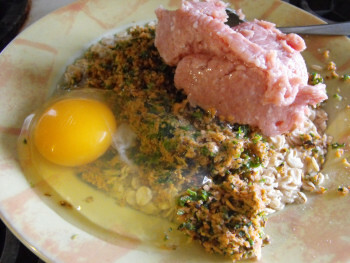 Lucy was head over heels in love with her dinner of overcooked oatmeal, raw ground turkey, blended sweet potatoes and mustard greens, and raw egg. She continued licking the bowl long after it was bare.